Nissan stores can order movie-themed items, and some locations will offer screenings of The Last Jedi. Much like fans, Nissan can’t seem to get enough of Star Wars. The automaker has partnered again with Walt Disney's Lucasfilm Ltd. for an out-of-this-world marketing campaign in Canada and the United States. The Nissan Rogue was vaulted into Star Wars’ galactic hype machine last year and basked in the spectacle surrounding the fortuitously-named Rogue One: A Star Wars Story movie. 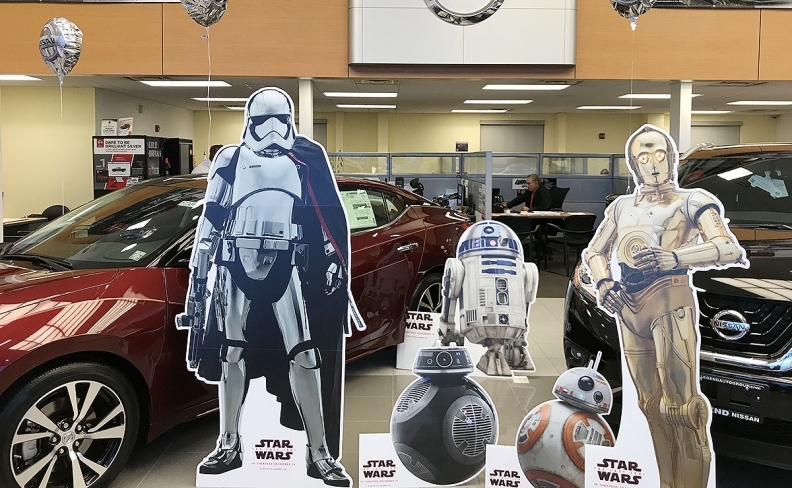 Nissan dealerships – many of which outfitted their stores with Rogue One decorations as part of the automaker's marketing alignment with the sci-fi film franchise – loved the connection to the beloved franchise. “Our dealers were really excited about it last year. More than anything, they were impressed with the traffic it seemed to drive. From a dealer perspective, that’s important,” Steve Rhind, director of marketing at Nissan Canada told Automotive News Canada in an interview. Rogue sales also increased in November and December 2016 – the height of the marketing campaign – when compared with the same two months the year before. November sales were up 45 per cent and December sales climbed 21 per cent. Nissan even offered a movie-themed limited-edition Rogue. But it was the cardboard cutouts that drew the most attention — and likely will again this year. Rhind said some customers required dealers include Stormtroopers in their new-vehicle purchase or risk losing the sale. “That doesn’t happen very often, that our point-of-sale material need to be included in the actual sale of a vehicle,” Rhind said. The cutouts were so popular that one ended up stolen from a greater-Toronto area dealership. For this latest tie-in, dealers had a challenge for Nissan’s marketing brass: How could they spread the interest across the Nissan lineup? The answer was a theme inspired by futuristic technologies in The Last Jedi. Many Nissan stores across the country will again serve as outposts for the Star Wars phenomenon. Nissan created a system where dealers can order movie-themed items – including those popular cutouts – for their stores. This year’s stock in Canada includes Stormtroopers and the C-P3O and BB8 characters. Nissan is not offering a Star Wars badged vehicle from the factory, but dealers will be able to offer Star Wars edition accessories like floor mats and logos for bumpers. Nissan Canada has also partnered with the Cineplex movie-theatre chain to allow dealers to offer special screenings of the new movie, which opens Dec. 15. “We want it to be as big, if not bigger than what we did last year,” Rhind said of the campaign. One thing Canadian dealers won’t have access to is the “Star Wars: Droid Repair Bay,” a 10-minute virtual story connected to the film. It’s available only to dealers in the United States. The experience uses Samsung Gear and HTC Vive headsets. Stores using HTC Vive will have a virtual reality cube for participants to go into as they make their way through the story. Meanwhile, total Canadian sales for Nissan are up 9.6 per cent to 125,901 vehicles through October when compared with 2016. Rhind said the automaker has continued to grow Rogue sales and introduced the Titan half-ton pickup and small Qashqai crossover, a smaller version of the Rogue. “Having the right cars at the right time in the right place has been a big factor for us,” he said. Vince Bond Jr. of Automotive News contributed to this report.